I've decided to make Mirabilia's "Crescent Dreams" into a birth announcement for my boyfriend's cousin, who will be having a baby boy later this year. With the exception of the hat (which I changed from yellow to blue), I'm stitching it as charted on Enchanted Fabric's "Raindrop Mystique" 32ct opalescent Lugana. This photo was taken after about ten hours of stitching. 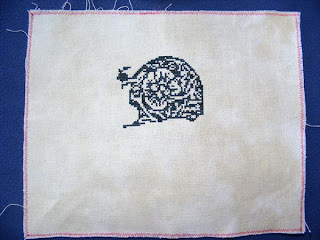 About six hours into the project the eye of my gold-plated DMC tapestry needle snapped off. I threw it away and replaced it with one of the more expensive gold John James tapestry needles I bought last summer. Less than an hour later the eye of that needle snapped in half. Today, sometime between hours eight and nine, I broke my second gold John James needle. I'm now on the third and final needle of the pack, which is already beginning to bend at the eye. Given the price, I'm quite disappointed. The less expensive and readily available DMC needles are much more durable. I'm quite sad that Enchanted Fabrics is closing shop, but I understand why it needs to be done. I'll miss Lori's creations. I hope her new job works out well for her and her family. I just placed my final order: $139.90 worth of fabric. If I weren't in the process of buying a house I'd have probably splurged a bit more. I tried to stick with colors and combinations that aren't similar to those made by Silkweaver. Posted by Lyndsey at 10:08 PM Labels: s.e.x. I started this one sometime last year as a favor for my Mom. She wanted something that she could gift to a friend that wasn't as time consuming, expensive, and extravagant as my usual projects. I'm not going to say exactly what it is in case they see this post, but I will say it's a piece by M Designs. It's being stitched on 28ct "Touch of Ecru" by Stony Creek using Weeks Dye Works "Twilight" cotton floss. 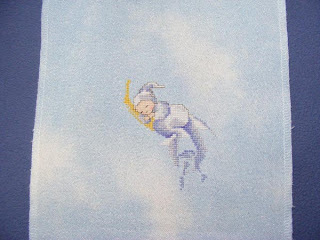 The current photo is the progress after one skein of floss. My boyfriend and I have been looking into buying our first house and it's taken up most of my time these last few weeks. Hopefully I'll have a few minutes to myself once we pick one and start the paperwork. We need to have a contract signed by the end of April to get the $8000.00 tax credit. Here's to hoping we find one in time! Right before our house-hunting began I managed a few more hours on "Swirly Sampler". 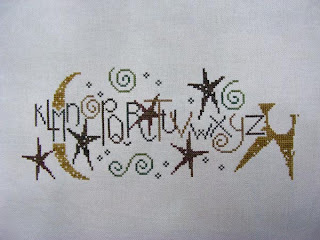 I finished the end of the alphabet (V, W, X, Y, and Z) and started the large, right-most star. 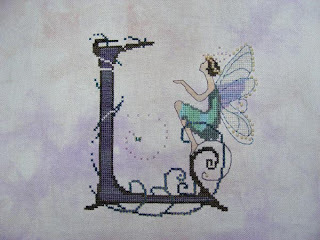 Today I did an hour or so of beading on "Letters From Nora: L". Sadly, it doesn't look much different from the last picture. I wouldn't mind the beading half as much if it the beads in the vines weren't in such long rows. Stitching beads in rows makes me grumpy as I can never get them to fit just right. I end up having to improvise and I'm always afraid that someone will notice that the beads don't quite line up with the stitches.